Director – Lowell Dean, Screenplay – Christian Piers Betley, Producers – Don Carmody, Kevin DeWalt & Mark Montague, Photography – Mark Dobrescu, Music – Igor Vrabac & Ken Worth, Visual Effects – Mr. X Inc. (Supervisor – Aaron Weintraub), Special Effects Supervisor – Paul Noel, Production Design – Kathy McCoy. Production Company – Minds Eye Entertainment/Don Carmody Productions. Six students in a forensics program are taken out to the remote grounds of the abandoned 13 Eerie Strait Penitentiary for a series of field tests. With their professor watching via video cameras, they are paired off and sent to examine a series of cadavers that have been placed in various locations around the grounds. However, they discover other bodies that are not meant to be there. These rise from the dead as zombies and comes after them. 13 Eerie was a Canadian-made zombie film from Don Carmody, a legendary producer responsible for everything from early David Cronenberg works to Chicago (2002) and the Resident Evil films. It was the second directorial outing for Lowell Dean who went on to make WolfCop (2014) and Another WolfCop (2017), plus the sf film SuperGrid (2018). The title 13 Eerie is a bit of a head-scratcher. It sounds like it should be the title of a lost radio-era horror anthology series and does nothing to suggest a zombie film. The grounds where the film take place – which are supposed to be those of an abandoned prison (although we never actually venture inside the building) – are awkwardly named 13 Eerie Strait to give justification for the title. Even then there is not a whole lot of plot going on. I am unable to decide if the idea of a zombie film set on a body farm is an improbable gimmick or a novelty idea. It doesn’t seem terribly inspiring – that said, the same idea also formed the basis of the subsequent Bigfoot vs Zombies (2016). And even then, this has the oddity of being a zombie outbreak film where there is zero explanation for the zombies whatsoever. For that matter, though the film is populated by some moderately well-known Canadian actors – Katharine Isabelle, Brendans Fletcher and Fehr – the characters are written with an absolute minimum of depth such that it becomes difficult telling some of them apart. The only performance that stands out is Nick Moran as a bus driver and general camp dogsbody of possible criminal past. The film reaches an annoyingly abrupt ending that seems to cut off the action in mid-scene with the remaining survivors trapped in a car as the zombies close in, only to realise that one of the zombies has the keys in their mouth. 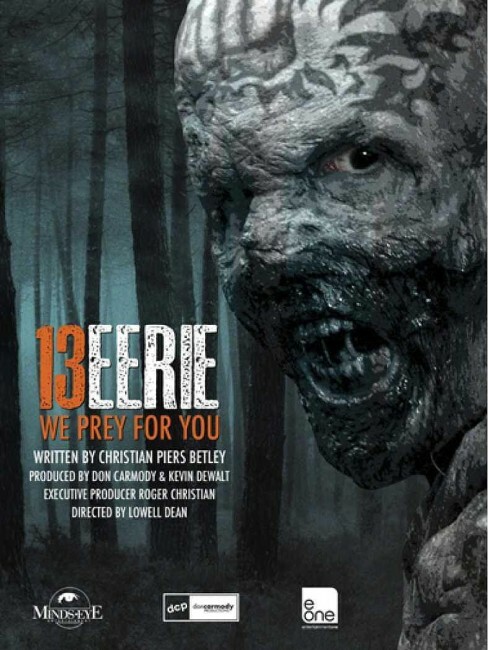 The one thing that 13 Eerie does have going for it is some highly convincing zombie effects and some exxxxtremely gory splatter and intestine munchings scenes. (The person(s) responsible for these is not named on the credits). The film takes more than half its running time to get started but certainly delivers the goods in this regard when it does. There is a particularly good scene where Katharine Isabelle impales one of her zombified classmates to the wall with an instrument through her jaw, only to have to fight off another zombie where the only available weapon is a sharp board, as all the while the impaled zombie attempts to get free by sliding her face up the handle of the instrument that goes in through her mouth and out her cheek.